Sometimes I love to have a little ice cream after my dinner, but I don't want it to be too heavy or to have a lot of added calories. 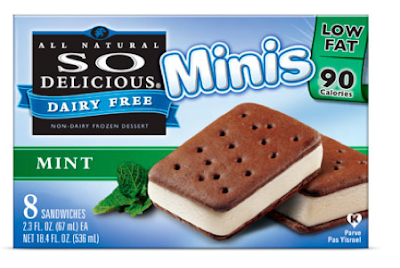 For a long time I was eating Julie's low calorie ice cream sandwiches which I think are the most delicious low calorie ice cream sandwiches I've ever had (the ice cream tastes as rich as regular ice cream). But, after a while, I decided I wanted to try a few other ice cream sandwich flavors since I've only found Julie's version in vanilla. That is when I first purchased So Delicious Minis. The first box I bought was mint flavored (made with soy milk), and the second box I bought was coconut flavored (made with coconut milk). Both are dairy free and all natural. The mint minis are pretty yummy. Each one is only 90 calories, 2 grams of fat, 1 gram of fiber and 8 grams of sugar (2 weight watchers points). But, I think I've decided that I like the coconut ones more. The coconut sandwiches have 100 calories, 3.5 grams of fat (omega 3 from the coconut milk), 2 grams of fiber, and 1 gram of protein (so also 2 weight watchers points). They also differ from the mint versions because they are sweetened with agave syrup instead of regular sugar. I bought these great little desserts at Whole Foods. I get the impression the coconut flavor is new and may be more difficult to find than the mint flavor. So, keep your eye out as it may show up after a few weeks or months. good treat and low cal dessert, so good! I love the mix of chocolate and mint... so, I'll go for that one! i'm having a great time learning from your site!! In fact, i've already bought some stuff that i find appealing :) But unfortunately, i don't live near any trader joes or whole foods so i'm having a hard time trying to get the more healthy and yummy foods that i'm looking for.. thanks for the good info !!! these look really yummy!! i'm a big ice cream person, so i try to eat it every day... if not twice haha same goes for peanut butter!! So I don't usually do this and it has nothing to do with this food in particular but I did LOVE the Black and White popcorn! I wanted to let you know I have discovered DelMonte Harvest Selections - they are shelf stored meals (I had Santa Fe Rice and Beans today) - no HFCS and 2 full servings of veggies! I think they are 6 WW points - it makes a good dinner or lunch. Just wanted to share.